A well-placed directional sign is obvious when you need it, and adds to its background when you do not. These indicating signs can be found in parks, signaling pathways; they can become directories, mapping out a building; they can even be signs showing warning or danger. But, regardless of the type, they are a necessity for any large area with multiple departments and passageways, such as office buildings, hospitals, universities, business parks, and parking garages. A directional sign is one of the oldest types of sign, and for good reason. It not only indicates a certain point or direction, it guides you, watches out for you. We use them daily when we run into a grocery store for something quick and try to find that specific isle. We need them when heading to meetings in buildings, when driving through town, even when using the restroom—imagine no bathroom signs with indicators of gender. Any company that has constant contact with employees, clients, vendors, and visitors must have directional signs, and often these signs can be drab, eyesores jutting from corners with poor design. 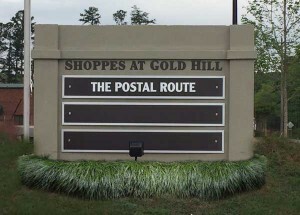 When constructing your signs, you should always opt for high-grade materials because in the end, you want a sign that can endure being touched and jostled from time to time. I suggest using signs composed of HDU, aluminum, acrylic substrates or acrylic. These are easily cleaned and require minimal maintenance. Your signs also need to fit nicely into the building’s décor—no matter how scaled up or down it is. This can be tough to figure out, with so many shapes of sign and font, so many colors and sizes to choose from. This is why it is advised to use a sign company, such as JC Signs, that has plenty of practice with sign placement and all the other details to giving the most concise and precise pieces of communication effectively.